‘LET It Rain,” Tracy Chapman’s latest release, reaffirms that she, indeed, carries the world upon her shoulders. A bag of laughs the 12-song album is not. But Chapman’s devotees, who will see her perform her dispirited ballads at San Francisco’s Fillmore Theater this weekend, probably aren’t exactly expecting a jubilee. The show is part of an exhaustive international tour that began in January and has placed the 39-year-old performer and her six-member backup band in front of adoring crowds in major venues across Western Europe and the U.S.
To many, Chapman is the troubadour of the oppressed, singing of society’s injustices and suffering intrinsic to the human heart. Her 1988 self-titled debut album received critical acclaim, catching the attention of a global audience when she performed at Nelson Mandela’s 70th birthday party that same year. anthems of a generation searching for their own Joan Baez or Woodie Guthrie. Raised in Cleveland, Ohio, Chapman began her career singing sensitive, autobiographical ballads of inner city struggles and racism. The sad songs, mixed with the distinctive warmth and depth of her voice, have universal appeal in the level of compassion they evoke. The new album, her sixth, has a similar sensitivity and musical tone. Like the first, her simple acoustic guitar compositions, lightly accompanied, stretch across musical genres, touching on rock, folk and gospel styles. Pretty heavy stuff, and to some extent, flat-out draining. But her voice is as strong and pure as it was years ago and the unique sense of comfort that it inspires is still very much present. With that in mind, it’s hard to imagine how her audience will likely respond to the performance. For most of the songs, dancing would seem almost inappropriate. Yet a concert hall full of comatose, introspective and possibly weeping fans, is equally hard to imagine. But regardless of the mood inside The Fillmore this weekend, Chapman’s performance will more than likely stir the emotions. 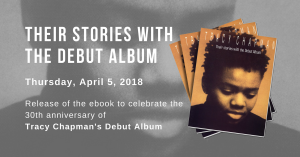 a-t-c.net: Who did ask you to make the concert poster for Tracy Chapman gigs in San Francisco? a-t-c.net: Where did you get inspiration from? CP: From listening to Tracy’s records, and reading about her on your site, among other places. This poster, like many of the posters I do, went through quite a few iterations before the Africa/sound hole idea was finalized and painted. I read that she majored in african studies at Harvard. I don’t know how big a part of her life that is, but it seemed appropriate. I usually try to get the feeling or romance of the artists music into the poster. With Tracy’s music, I heard alot of hope and optimism juxtaposed with a turbulent world. So I put a bright sky with puffly little clouds in the guitar, and dark, brooding threatening clouds in the background. My favorite lesbian singer-songwriter, Christie McCarthy, posed for the hands and body with my guitar. a-t-c.net: Did you receive any comment by Tracy herself? CP: No, but she was gracious enough to sign one of them for me, which I appreciate. I would love to know if she liked it, since I always try very hard to make it something meaningful to the performer. a-t-c.net: Where can we purchase this poster? CP: You can purchase a signed copy of this poster at petersonland.com Just click on posters, and it’ll be right there.